We had our usual breakfast at the conveniently nearby Waffle House again this morning. The curious thing is that although we always order the same thing, the bill is never for the same amount twice. We’ve found this to be a fairly consistent inconsistency. Jennifer had asked if we could take care of Dillon for the day so that she could attend the hospital with Dave’s family. We were headed for a nice little beach that we know of just up the coast called Mickler’s Landing and were more than happy to take Dillon along with us. We used to go to this particular beach quite often when we lived here in Jacksonville. ￼It was our favourite place to search for shark’s teeth. 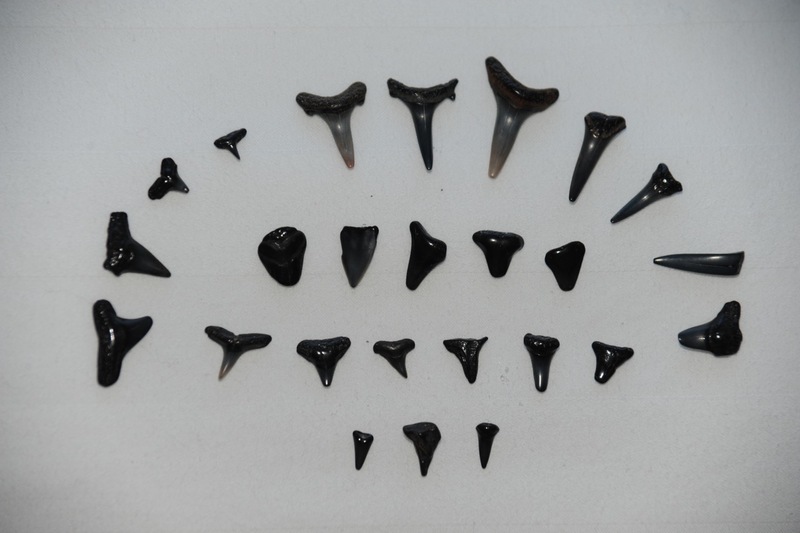 If you know here to look, fossilised sharks teeth that are millions of years old can be found up and down the Florida coastline. Mickler’s Landing is a particularly good place to hunt for them in this region of the coast. I think it’s because of the way that the beach is at an incline. This allows the waves to continually wash away the top few millimetres of sand each time and thus expose the teeth, which tend to jostle to the surface. Jacksonville’s beaches are very flat and compact and we’ve never found any sharks teeth there. It was a little tricky trying to concentrate of locating the sharks teeth with three kids under our charge but despite that handicap, we still managed a bumper catch of no less than twenty-seven over the course of the hour that we were there. Even by our standards this was a very good haul. When we lived here, we’d consider fifteen or more to be a good day and at times came away with very few or even none at all. With the fairly steep incline and the very turbulent waves crashing violently, we had to keep a close eye on both Dillon & Joey. Jennifer wouldn’t go anywhere near the water by herself. Indeed, she wouldn't go anywhere at all for the first forty-five minutes unless she was being carried. There was a lot of seaweed washed up along the shore today and we even found several large planks of wood. This didn’t seem to bother some of the surfers that were taking advantage of some of the very nice waves. We were well into the kids’ naptime before we called it a day. It was a very poignant and nostalgic visit for both Sandy and me. When we left Florida for good back in 2002, I distinctly remember us talking about defining our experience and time here by the frequent visits to this beach in search of shark’s teeth. Back home, tucked away safely in a zip-lock bag, we have our accumulated stash of shark’s teeth that we collected over the years. There must be several hundred of them altogether and we tend to think of this as being the one physical thing that we took away with us as a reminder of our time here. We always felt that looking for shark’s teeth was one of the most fun things we did and spent many an hour relaxing as we combed this stretch of beach over and over. Ah, the good old days. Back at the car park, we washed the kids down and packed them into the car. On the way back, we stopped off at a McDonald’s for a late lunch treat for the three of them. Back at the condo, Joey and Jennifer were put to bed for a rather later than usual nap and Dillon was collected by Jennifer. Sandy and I enjoyed another wonderful Jacuzzi soak and this time we remembered to switch off the jets before standing up. Sandy next set about sorting out how to distribute the weight in the various suitcases we now had to stuff full of all the purchases we’ve made since arriving. Jennifer had leant us a set of bathroom scales, which was a great help. We ordered take out for dinner before going into overdrive trying to tidy up the place ahead of an anticipated visit - which was cancelled on us at the very last minute. Oh well. It was still a good thing that we tidied the place up since we only have two more nights here. Jennifer & Dillon, then Sandi and then finally Dave all came up for a chat before we all turned in for the night.